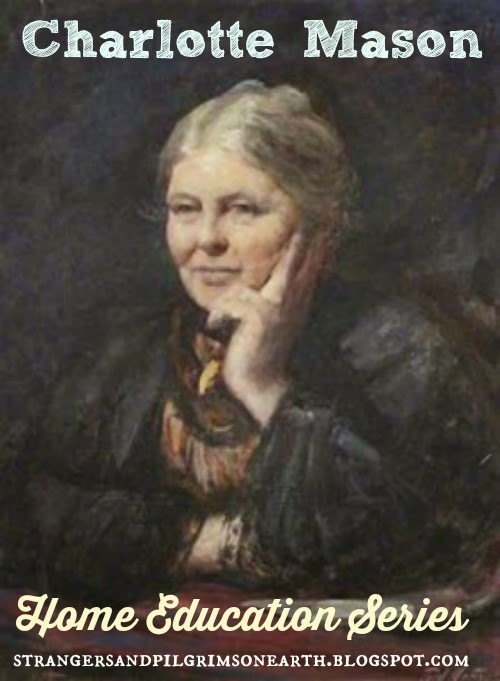 "It is a great thing to take these young and tender lives, rich with so many possibilities of beauty, of joy, of power—all of which may be wrecked—and to become responsible for their shaping and training, and for the up building of their character. This is what must be thought of in the making of a home. 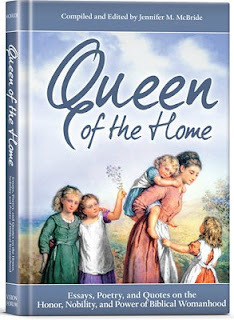 It must be a home in which children will grow up for true and noble life—for God and for heaven." I feel so much sorrow for the children growing up in this era. 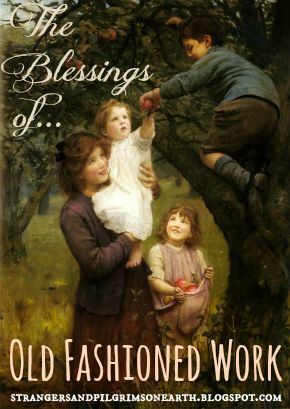 They are missing the wholesome lifestyle that we had when young such as climbing trees, riding bikes and building forts. Though we can't change the time period that they were born in, we can make a difference in our own homes. 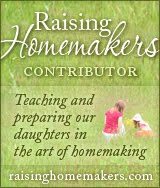 Here are some inspiring posts pertaining to child-raising that were shared on our second edition of The Art of Home-Making Mondays. 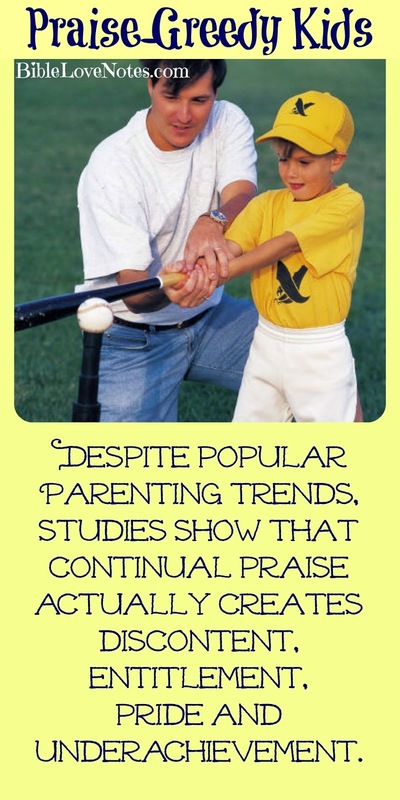 This was an interesting article concerning the way we raise our children on praise. 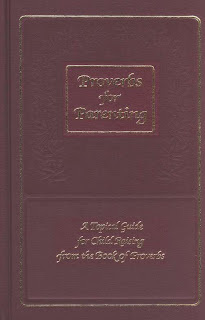 Gail at Bible Love Notes requires only a minute of your time to re-evaluate the latest parenting trend. What are your thoughts on this? 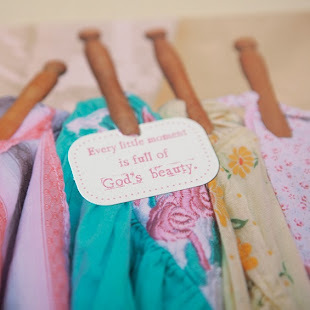 This post by Jacqueline at Deep Roots at Home spoke the very concern of my heart! So much stimulation from electronics and so little time in the real world with us! 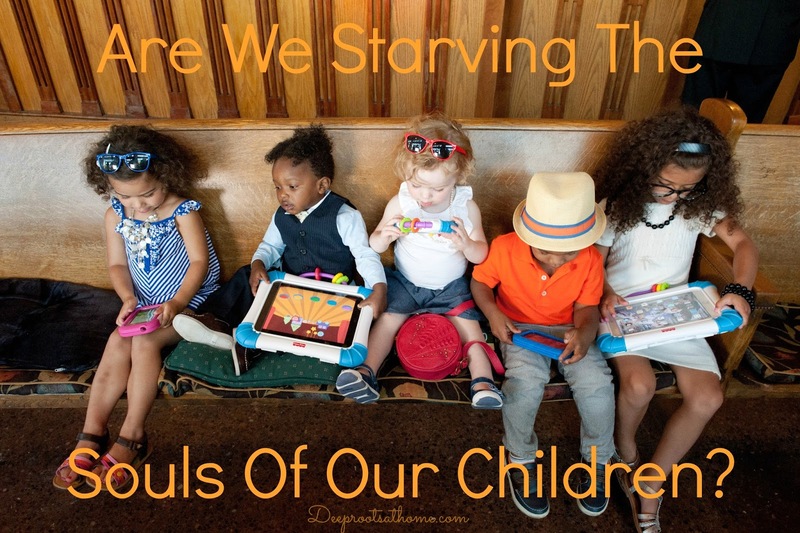 Are we starving the souls of our children? 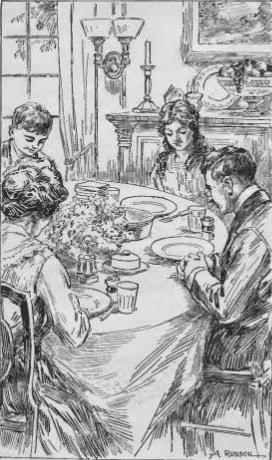 I hope this challenges the reader to reconsider how their family spends their time. The question is, do you have a parenting plan? What are your goals? What kind of family life do you hope to provide? Will you allow video games? Free access to the remote control? Unguarded internet access? These subjects are worth conversation. 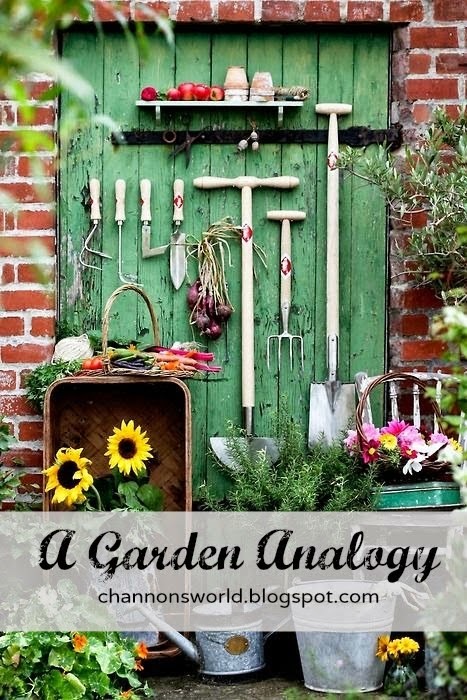 Sunshine by Channon gives a garden analogy that will remind you of the importance of biblical vision when raising your children. Thank you ladies for sharing your wisdom with us! 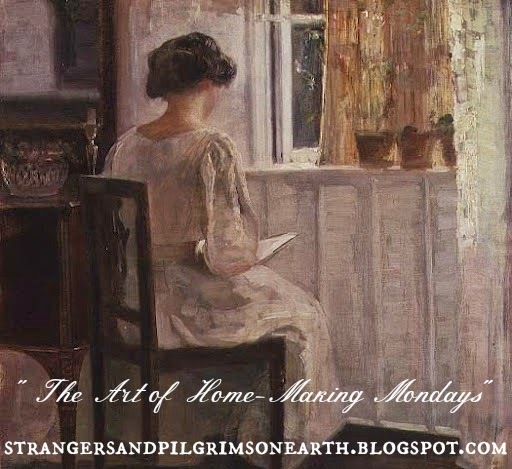 I invite you all to join us next week at The Art of Home-Making Mondays. "Childhood comes but once with its opportunities. 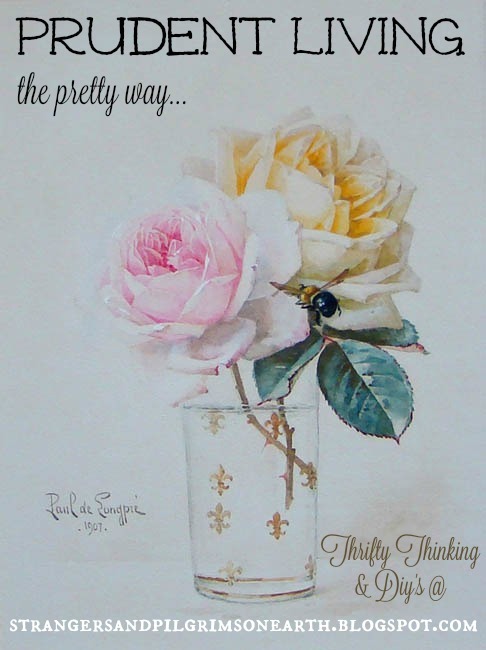 Whatever is done to stamp it with beauty, must be done quickly!" 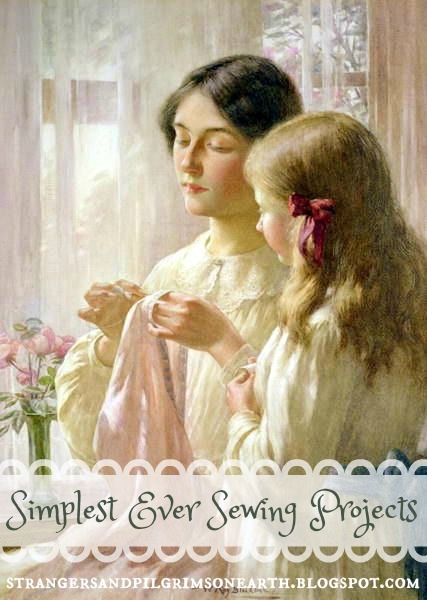 This post may be shared with some or all of the following link-ups: The Art of Home-Making Mondays, Modest Mom Monday's, Homestead Barn Hop, Teach Me Tuesday, Raising Homemakers, Make Bake Create, Wise Woman Link Up, Christian Homemaking, Wow Us Wednesdays, Wildcrafting Wednesday, The Scoop, Homemaking Thursdays, From the Farm Blog Hop, Encouraging Homemakers, Farmgirl Friday, Front Porch Friday Blog Hop, Home Acre Hop, Simple Meals Friday and Clever Chicks Blog Hop. Thank you lovely ladies for hosting these. Hope the jam is strawberry." 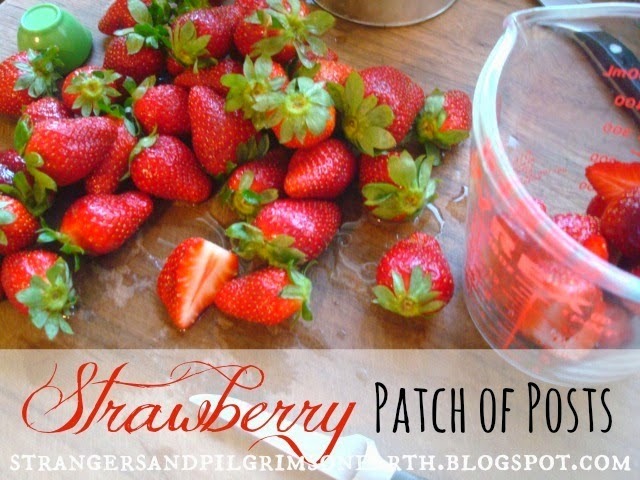 As promised, more strawberry love... As if strawberry jam isn't a tasty enough treat, the thought of labeling some jars for gifts is just as sweet! 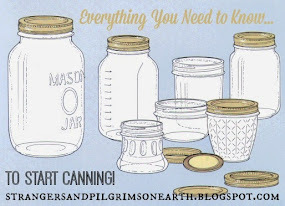 We found these labels at the Graphics Fairy and placed them on a convenient printable sheet for you to use in all your preserving adventures. 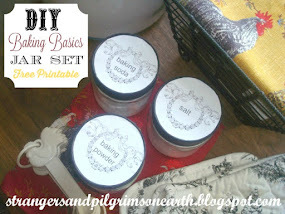 Next week we will share round labels for mason jar lids. 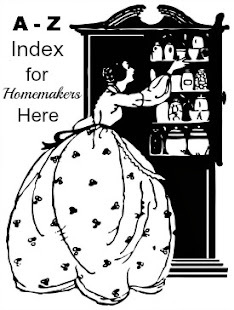 Happy homemaking, ladies! All the fine print. 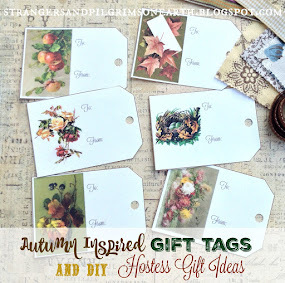 This post may be shared with some or all of the following link-ups: The Art of Home-Making Mondays, Modest Mom Monday's, Monday's Musings, Make Your Home Sing Monday, Good Morning Mondays, The Scoop, Titus 2 Tuesdays, Tuesdays with a Twist, Raising Homemakers, Wise Woman Link Up, Homestead Blog Hop, Wow Us Wednesdays, Coffee and Conversation, Homemaking Thursdays, Home Sweet Home, Our Simple Homestead, From the Farm Blog Hop, Front Porch Friday Blog Hop, Awesome Life Friday Link Up, Five Star Frou Frou Friday, Shabbilicious Friday, Simply Natural Saturdays and Clever Chicks Blog Hop. Thank you lovely ladies for hosting these. This post may contain affiliate links (which are merchant links that help to support this site at no additional cost to you if you purchase an item from them). Who doesn't love strawberries? 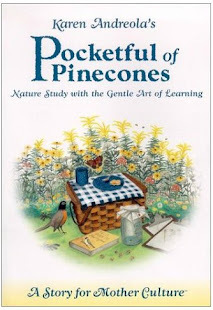 Sometimes, it is pleasant to do a relaxed summer study (less writing, more oral and fun work) with the children to keep them occupied in healthy pursuits. 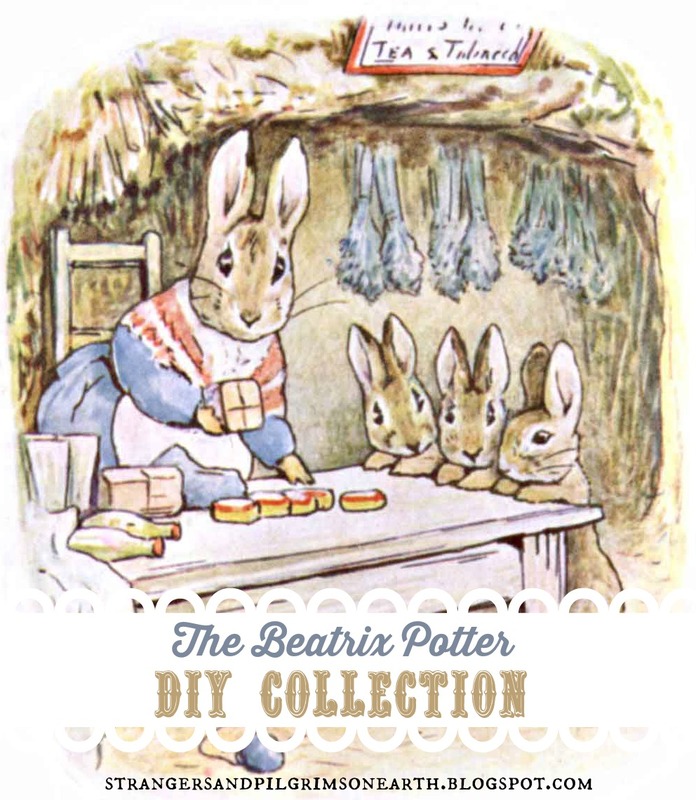 Here are some books and activities that I think everyone in the family will enjoy. 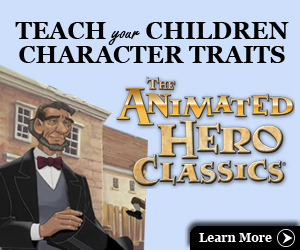 Your children will love to learn this way! 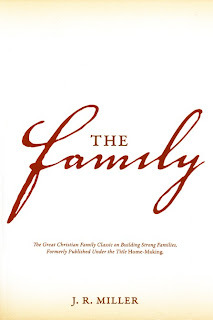 I would suggest reading together from the above chapter book for 1/2 hour a day. Have your children do some of the listed activities below each day according to their abilities. For this simple study, include any work inside a file folder for each child. 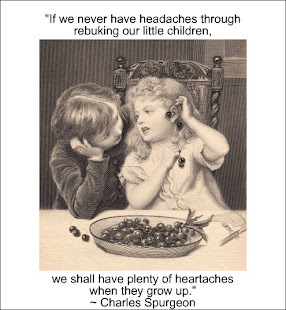 Have them decorate them with pictures of strawberries. When finished, the folders will make a nice educational keepsake of your summer. 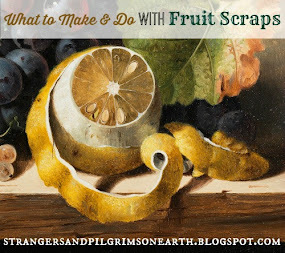 Bible/Family Discussion: What does Scripture say about "fruit"? 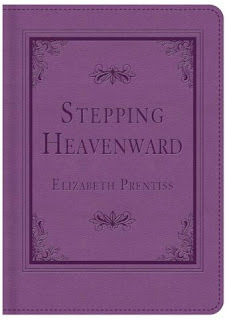 Read a passage every day and discuss the spiritual meaning of "fruit". Bible/Art: Have your children write out the fruits of the spirit, decorate the paper and display on a wall until memorized. Language Arts/Word Scramble Game: See how many different words the children can come up with using the letters that spell "s t r a w b e r r y". Give them 3 - 5 minutes. 5 letter words and up are 3 points, 4 letter words are 2 points and 3 letters words and under are 1 point. I live here in town. "Strawberry jam," for my nose had guessed it! Time goes by on wings. "What do you do all alone," I asked her. "I make jam and things." When it was time to go home I kissed her. "Thanks for the lovely day!" Language Arts/Grammar: Read the poem above to your children. If you like, you can also have them copy it in their best handwriting, making sure to use all proper punctuation for summer practice. Language Arts/Grammar: See if the children can point out the nouns in the poem above, followed by the verbs and then the adjectives. 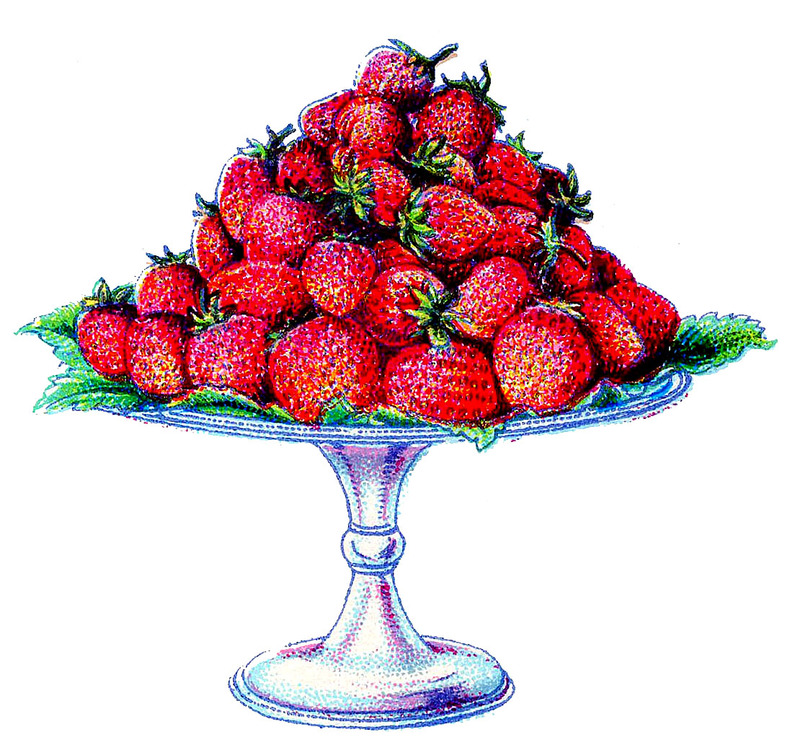 Language Arts: Have your children make up their own poems about strawberries. 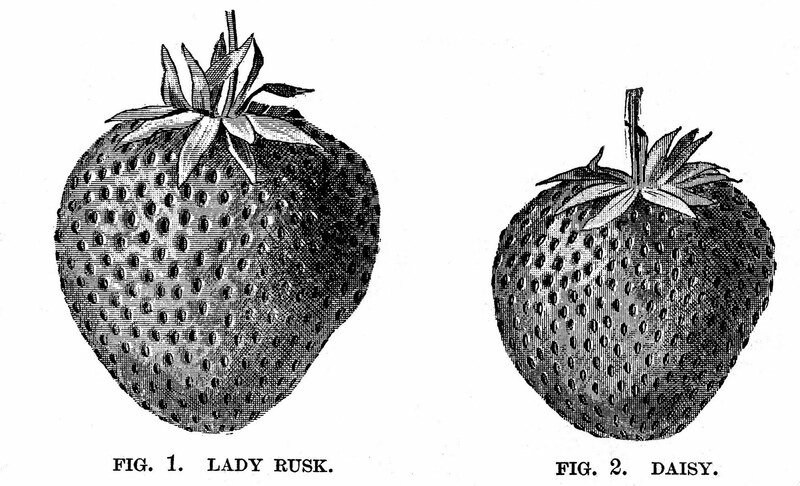 Science/Nature: Read about strawberries in a picture book or encyclopedia. 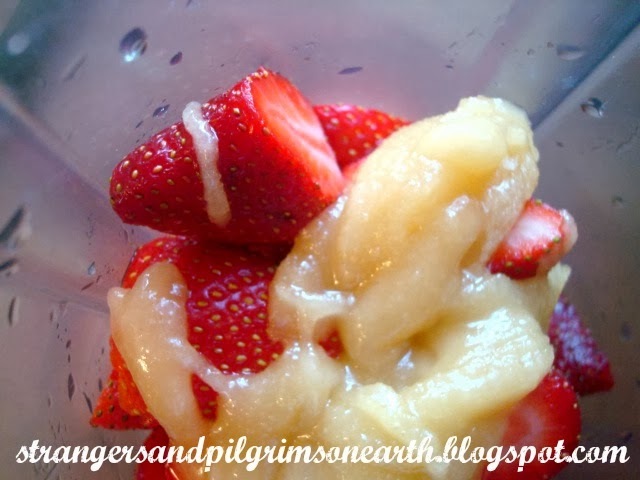 Science/Nature: Plant some strawberries in your backyard. Read about what area is best to plant them and any gardening tips. 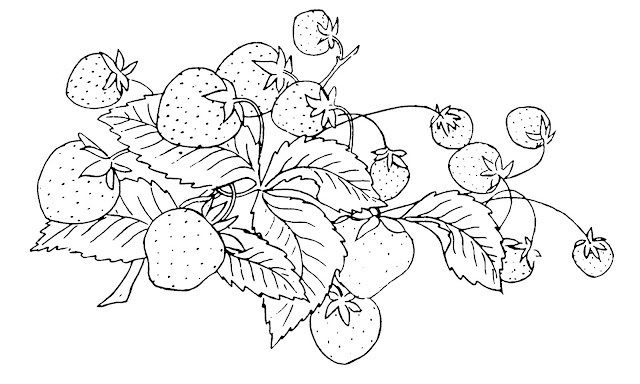 Science/Nature: Draw a picture of a strawberry plant with its leaves and stems and label its parts. 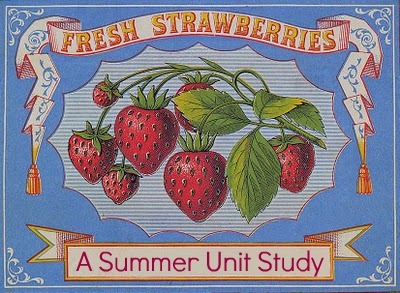 Science/Health: Research the health properties of a strawberry and have students give an oral report of their findings. 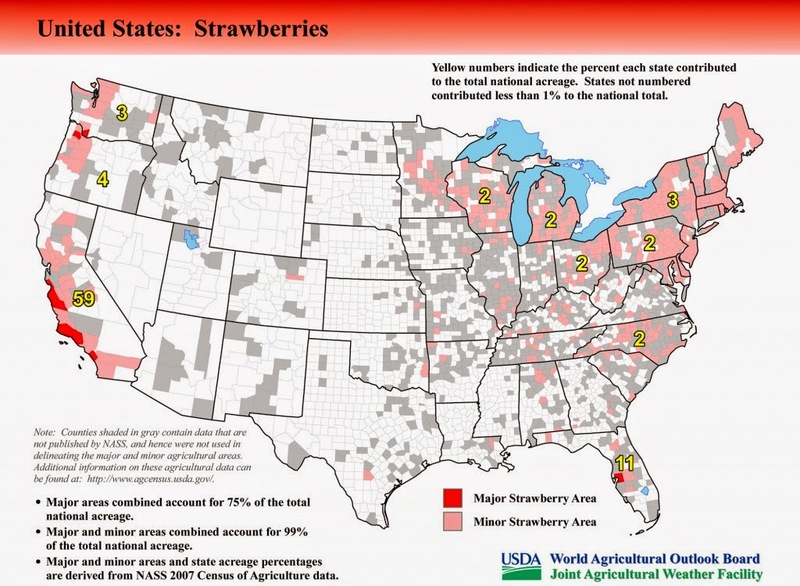 Geography: Using the information shared here, find out which states are strawberry growers and have your children point them out on a map or globe, each taking a turn. History: Read Saving Strawberry Farm and discuss the Great Depression with your children. 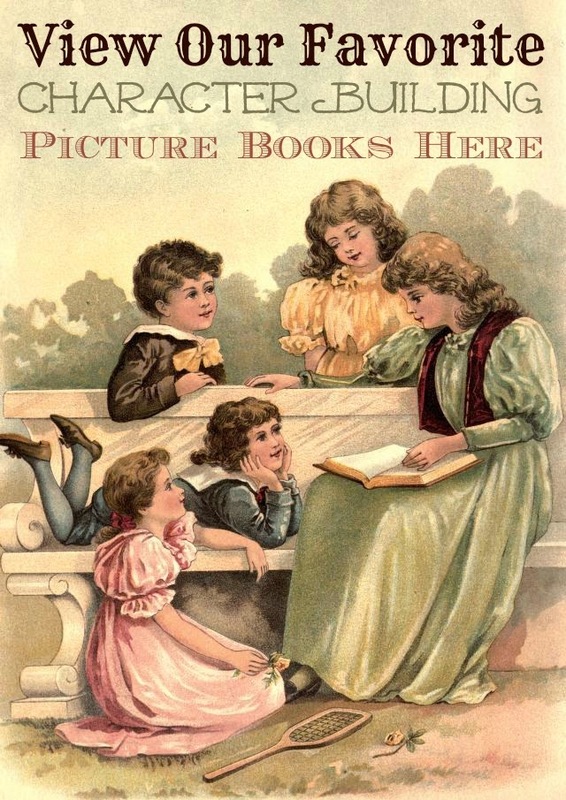 Do you have any family stories to share in this time period? The children would love to hear them! Family Field Trip/Geography: Go to a u-pick strawberry farm or festival. 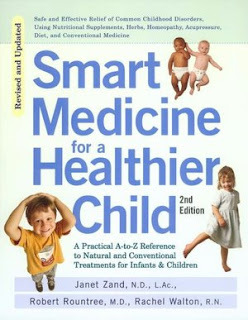 If you have an older child, see if they can map out the route for you. 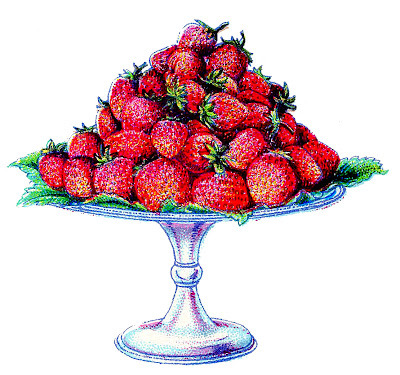 Home Economics/Art: Teach your daughter(s) to embroider using this strawberry image from The Graphics Fairy. Younger children can use this picture as a coloring page. 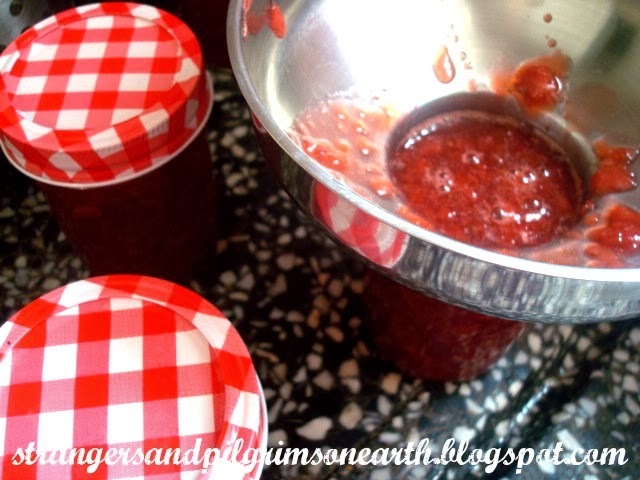 Home Economics/Math: Make strawberry jam. Freezer jam is easy for small children. 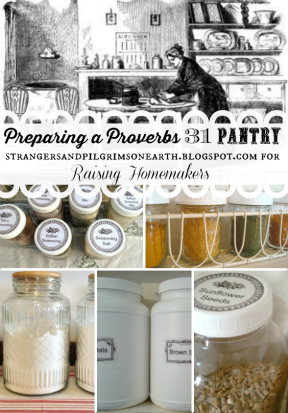 If you have older children you many want to try canning some jam. Have the children do all the measuring. Home Economics/Math: Make a strawberry pie, strawberry shortcake or chocolate dipped strawberries together. Have the children do all the measuring. 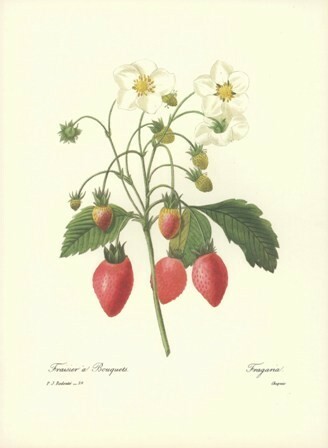 Art: Draw and color a botanical strawberry picture like Joseph Redoute and Elizabeth Blackwell. 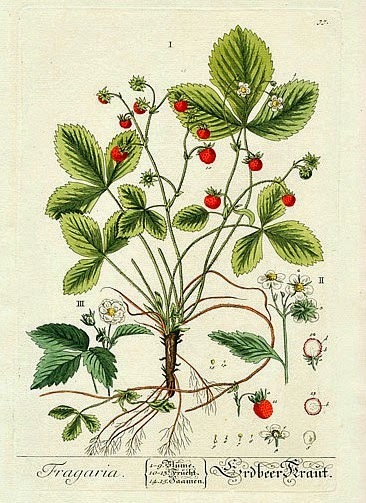 Have children include the Latin name of strawberry on their illustration. Arts/Crafts: Have your children do thumbprints with red ink or paint. Once dry, decorate them with black dots and a green stem. 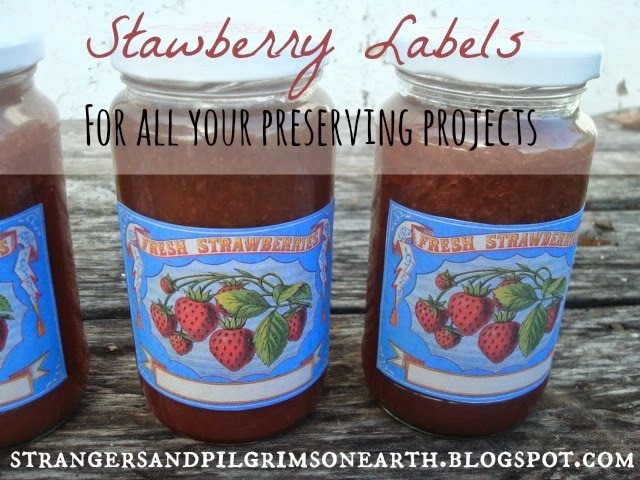 Use these "strawberries" to create custom jam labels, etc. Foreign Language: Learn how to say "fruit" and "strawberry" in the foreign language you are studying. Use the words daily as you study this topic. 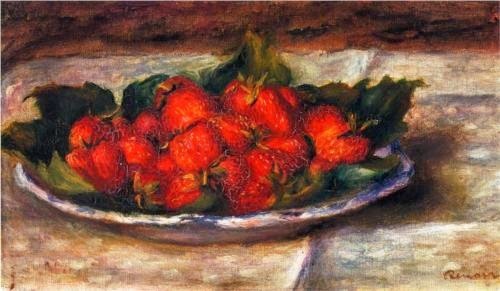 Art History/Art Appreciation: Study the strawberry paintings by Renoir (shown above). Have the children point out all the different colors used in the painting. 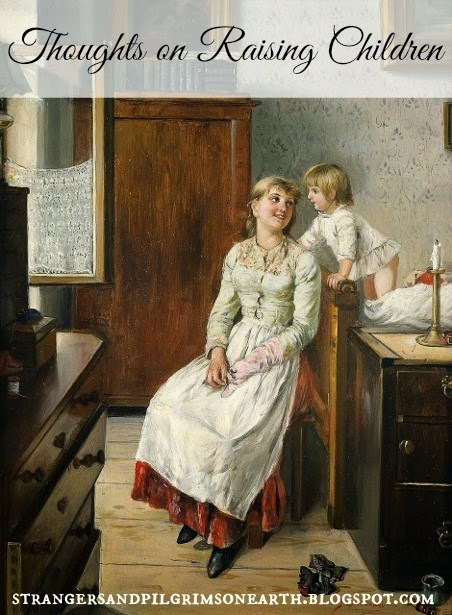 Have them point out all the details in the painting. View some of the other strawberry paintings by Renoir such as Still Life with Strawberries 1880, Still Life with Strawberries 1905, and Strawberries. Explain to the children that he did many other paintings on strawberries as well. Practice makes perfect! Art: After reviewing all the Renoir paintings of strawberries, bring out the paints and have your children create their own strawberry masterpieces. Have them prepare a still life scene on the kitchen table using some dishes, etc., as props. Art History: Read some information about Renoir to your children now that they have some knowledge of his artwork. What type of painter was he? All the fine print. 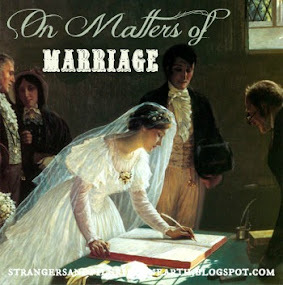 This post may be shared with some or all of the following link-ups: The Art of Home-Making Mondays, Modest Mom Monday's, Monday's Musings, Make Your Home Sing Monday, Good Morning Mondays, The Scoop, Titus 2 Tuesdays, Tuesdays with a Twist, Raising Homemakers, Wise Woman Link Up, Homestead Blog Hop, Wow Us Wednesdays, Coffee and Conversation, Homemaking Thursdays, Home Sweet Home, Our Simple Homestead, From the Farm Blog Hop, Awesome Life Friday Link Up, Five Star Frou Frou Friday, Shabbilicious Friday, Simply Natural Saturdays and Clever Chicks Blog Hop. Thank you lovely ladies for hosting these. This post may contain affiliate links (which are merchant links that help to support this site at no additional cost to you if you purchase an item through them). 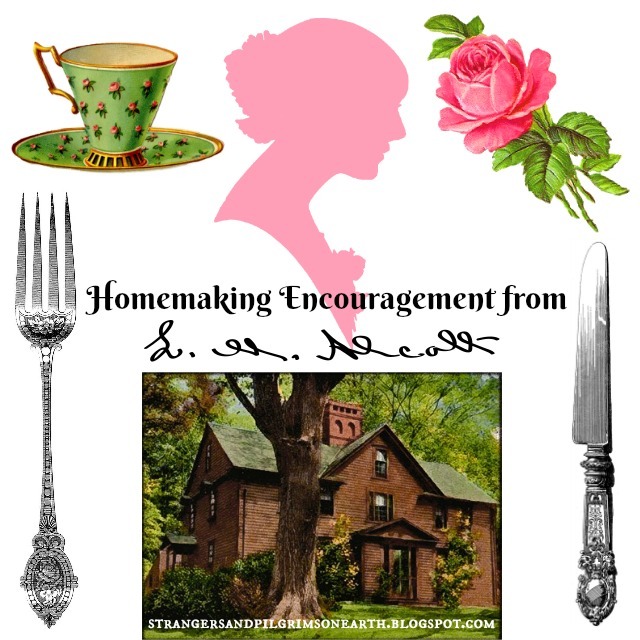 ~~Please link up what is in your heart and home this week in the spirit of Titus 2 and Proverbs 31 (such as recipes, godly encouragement, DIY's, frugal living, child-raising, medicine making, preparedness, gardening, home decoration, school lessons, etc).~~ You are welcome to share as many posts as you like! 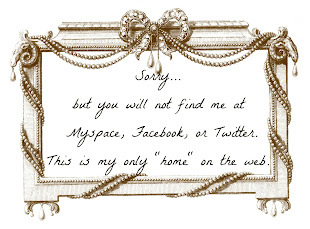 If you don't have a blog, please leave a comment of what has been going on in your home this week. I would love to hear from you! 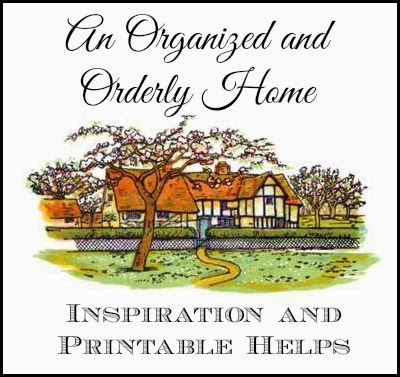 For the sake of our readers, please link up appropriate and wholesome home-related articles and leave out any giveaways, advertisements, etc. Thank you for understanding! I can't wait to see what you all have to share! Thank you for joining us! 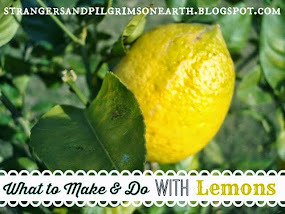 This post may be shared with some or all of the following link-ups: The Art of Home-Making Mondays, Modest Mom Monday's, Homestead Barn Hop, Teach Me Tuesday, Raising Homemakers, Make Bake Create, Wise Woman Link Up, Christian Homemaking, Wow Us Wednesdays, Wildcrafting Wednesday, The Scoop, Homemaking Thursdays, From the Farm Blog Hop, Encouraging Homemakers, Farmgirl Friday, Front Porch Friday Blog Hop, Home Acre Hop, Simple Meals Friday and Clever Chicks Blog Hop. Thank you lovely ladies for hosting these. 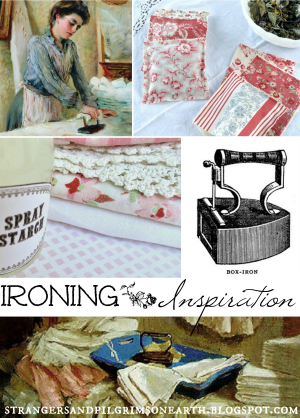 Today we are featuring three posts from our latest edition of "The Art of Home-Making Mondays" link up. 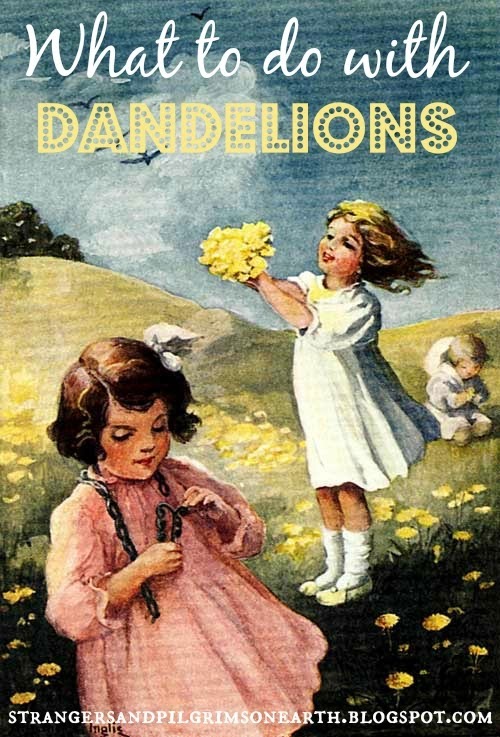 They concern that "pesky" plant we call dandelions. 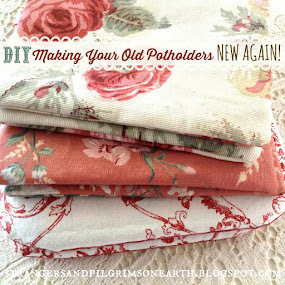 I loved seeing how many wonderful ways a prudent homemaker can utilize this so-called "weed"! 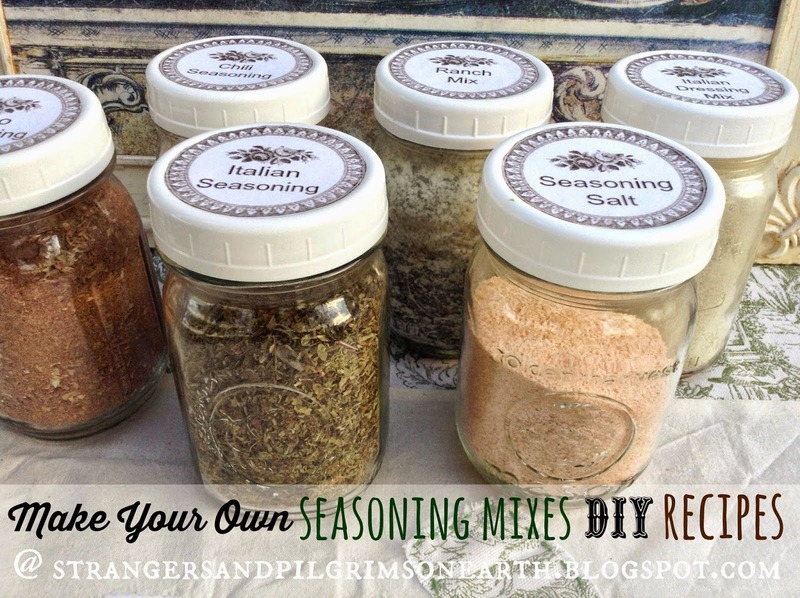 Annie at Annie's Place shares all about dandelions in her herb series. 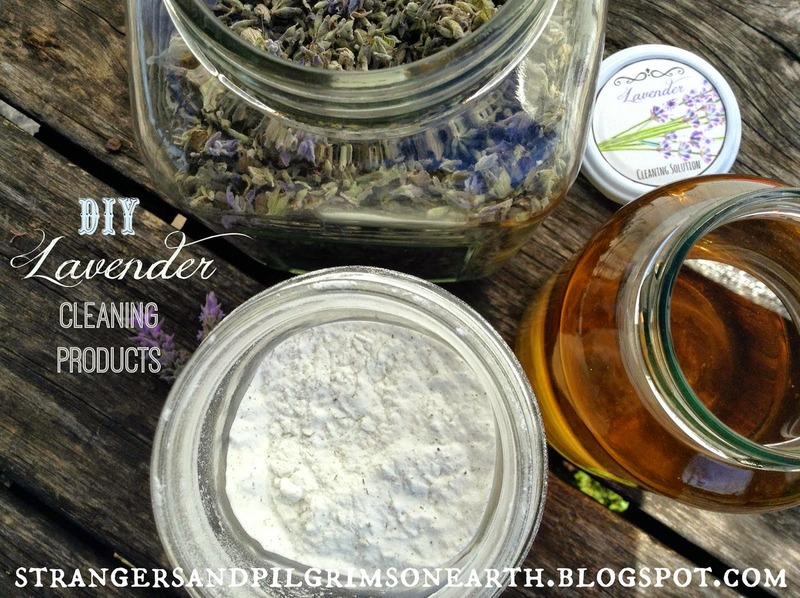 She shares the medicinal properties and the many uses for this humble plant. 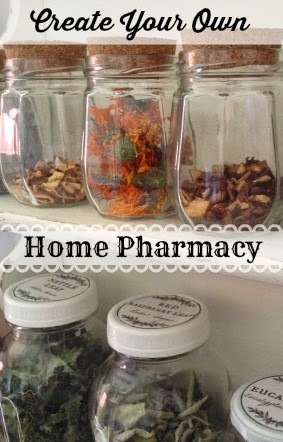 She shares how you can make them into tinctures, vinegar, dry them for capsule form, make them into meals, etc. 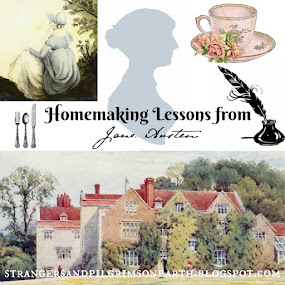 You will learn much from a visit to her blog. 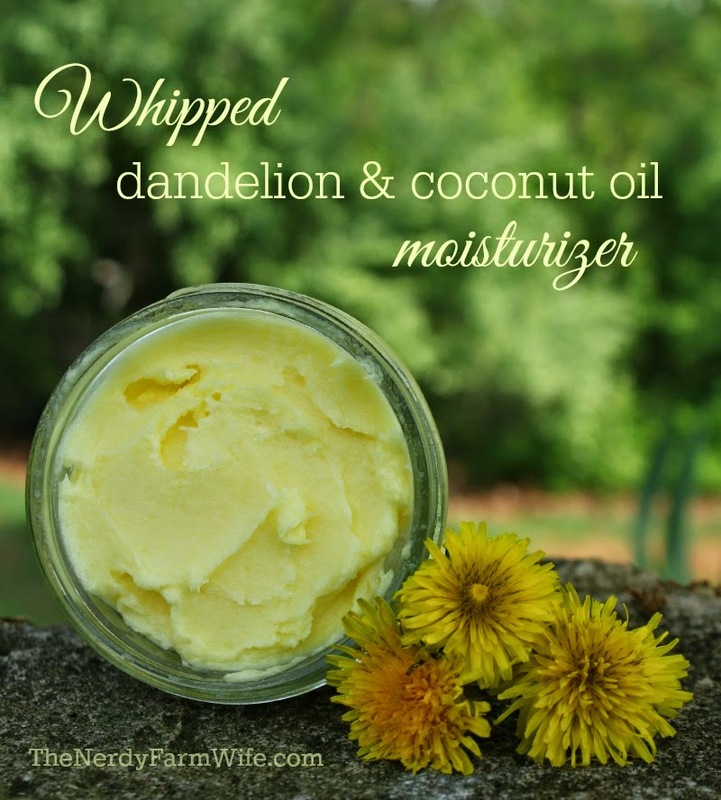 Jan at The Nerdy Farm Wife shared how to make a moisturizer from only two ingredients; coconut oil and dandelion flowers. That sounds delightfully dandy to me! 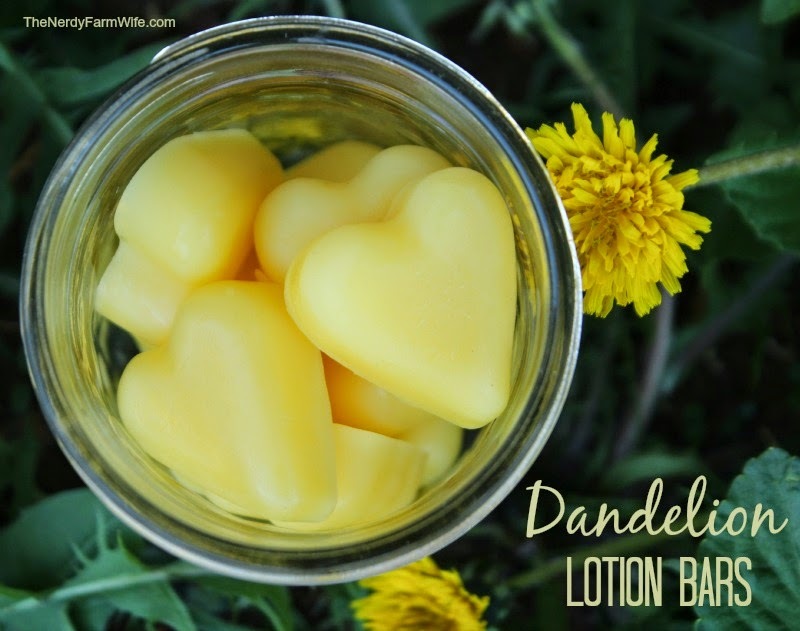 She also shared how to make dandelion lotion bars which would be a blessing for chapped and rough skin. 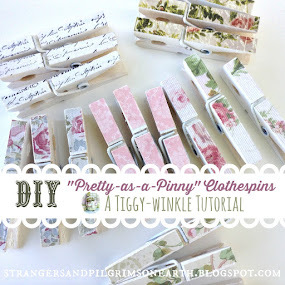 This looks like a fun project and a great gift idea. 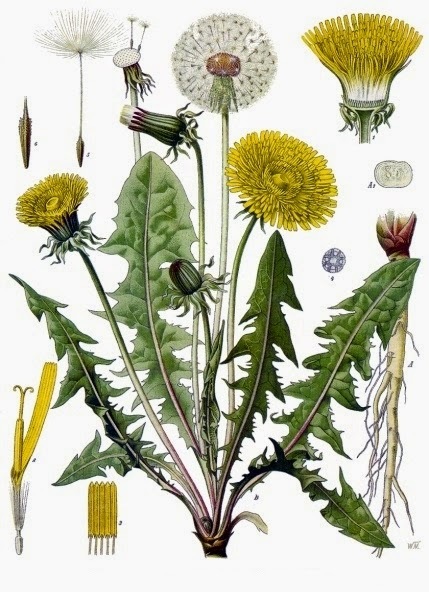 After reading these informative posts, I am sure you will come away thinking that a dandelion is anything but common! 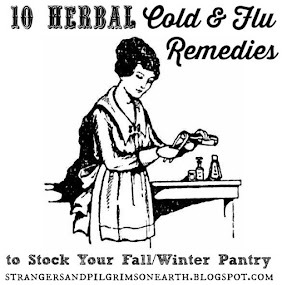 You may also want to add this information into your herbal. Thank you ladies for sharing your wisdom with us! 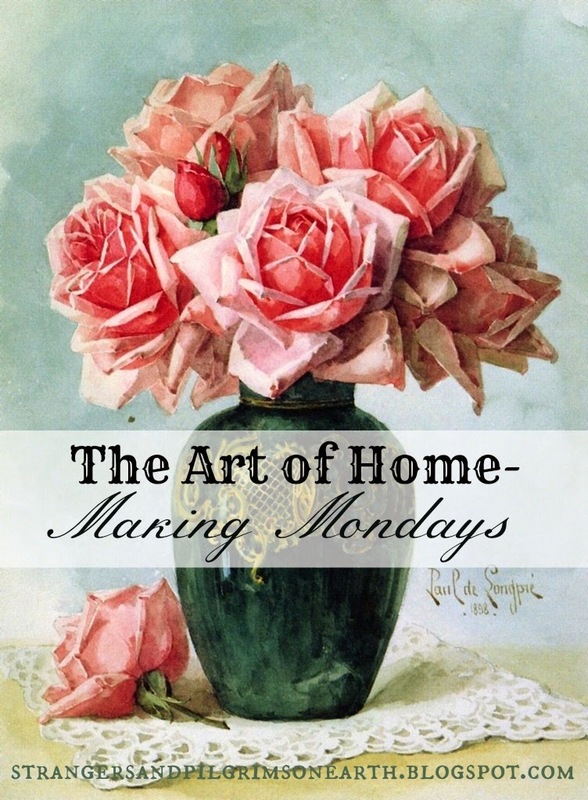 I invite you all to join us this upcoming week at the Art of Home-Making Mondays. 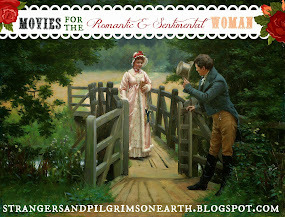 This post may be shared with some or all of the following link-ups: The Art of Home-Making Mondays, Modest Mom Monday's, Monday's Musings, Make Your Home Sing Monday, Good Morning Mondays, The Scoop, Titus 2sdays, Titus 2 Tuesdays, Roses of Inspiration, Tuesdays with a Twist, Raising Homemakers, Wise Woman Link Up, Homestead Blog Hop, Wow Us Wednesdays, Wildcrafting Wednesday, Coffee and Conversation, So Much at Home, Homemaking Thursdays, Home Sweet Home, Home Acre Hop, Growing in Grace Thursdays, From the Farm Blog Hop, Farmgirl Friday, Front Porch Friday Blog Hop, Awesome Life Friday Link Up, Simply Natural Saturdays and Clever Chicks Blog Hop. Thank you lovely ladies for hosting these. 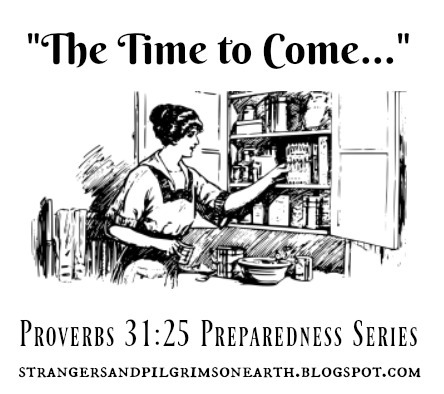 A few months back, my husband and I watched the science-fiction, Christian drama titled, "Remember". If one was to view this DVD without being informed of present day legislature, you might consider it ridiculous and only realistic in a b-movie fiction platform. The scary part is that this is already a reality in some areas of the world. Perhaps it is not to the the extent where parents aren't allowed to raise their own children. The difference is, parents are being dictated how to raise them. If they do not follow what the United Nations has deemed appropriate, they are at danger of potentially losing their children. 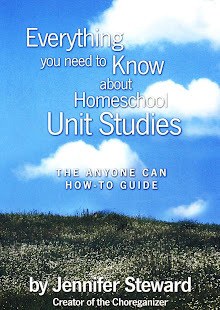 While attending a homeschool convention last summer, we learned some scary facts from Michael Smith, Esq about the UN turning some European countries into nanny states. In Scotland, it has just been signed into law that every child will be appointed a guardian of the state. 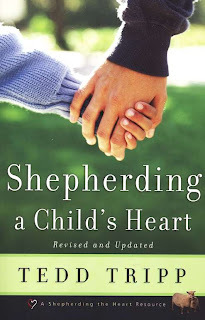 If that child feels like it is being mistreated in any way (i.e., told to attend church on Sunday), they have the power to inform their state appointed guardian of the Christian pressure at home, leaving the parent powerless to raise their children according to Biblical principles. 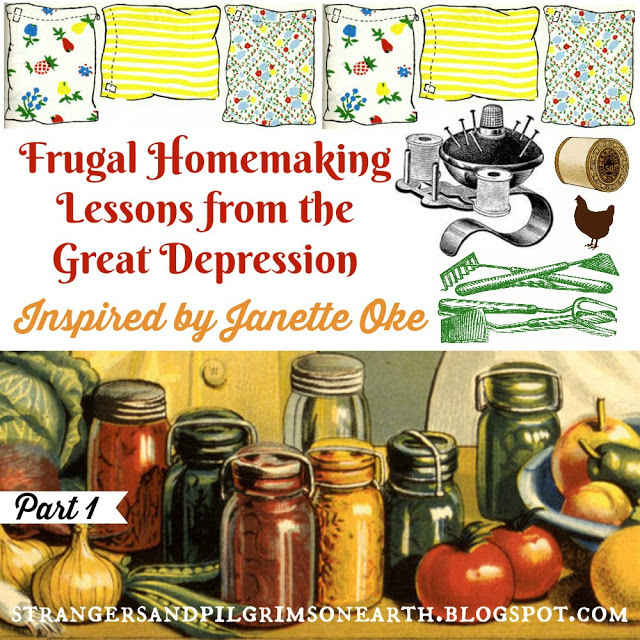 I usually try to keep this blog a happy place focused on homemaking, however, without the freedom to direct our families, what is a home? The United Nations is pushing the United States to sign a similar treaty which will give the responsibility of raising children over to the government and international forces. Do you realize the scary implications here? If you think these laws will NOT touch the United States, then you may need to read the "Unbelievable State of Parental Rights in America" or view the documentary below (better yet, wait till your husband comes home and watch it together). It is heartbreaking. Thank God that there are God-fearing people who spend their time fighting for our children for us. 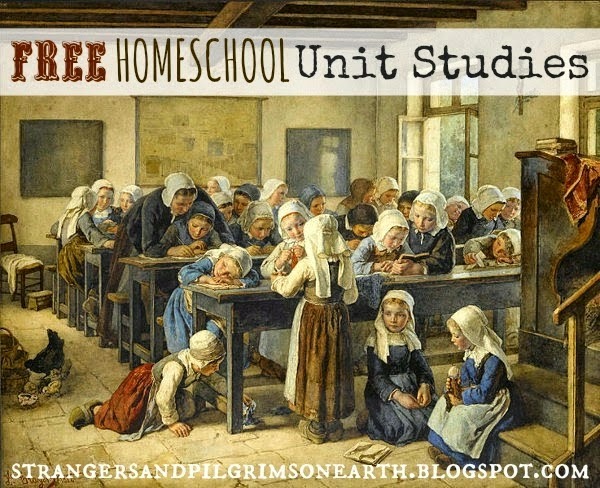 As the HSLDA is a blessing for homeschool freedom, Parental Rights.org is here to protect your family freedom, your God given right to raise up your child for His glory. Please find it in your hearts to support Parental Rights.org (I am not affiliated with these people in any way except as a concerned parent). Membership is only $35 a year. What a small price to pay for your family! More information will be found here. Here is a link of more videos concerning this topic. 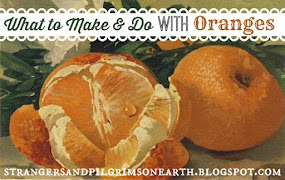 This post may be shared with some or all of the following link-ups: The Art of Home-Making Mondays, Modest Mom Monday's, Homestead Barn Hop, Teach Me Tuesday, Raising Homemakers, Make Bake Create, Wise Woman Link Up, Christian Homemaking, Wow Us Wednesdays, Wildcrafting Wednesday, The Scoop, Homemaking Thursdays, From the Farm Blog Hop, Encouraging Homemakers, Farmgirl Friday, Front Porch Friday Blog Hop, Simple Meals Friday and Clever Chicks Blog Hop. Thank you lovely ladies for hosting these. 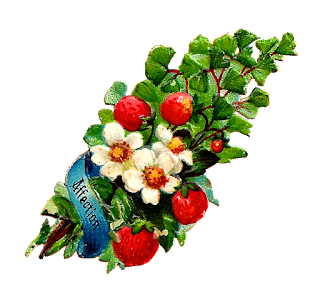 "I had the agreeable surprise of finding several scarlet strawberries quite ripe – had you been at home, this would have been a pleasure lost!" We only purchase strawberries when they are in season and when we do, we make sure to stock up on them. Our aim is to preserve them to keep them usable for the duration of the year. Unfortunately, they still don't last long! Preparing frozen strawberries are always first on our list. 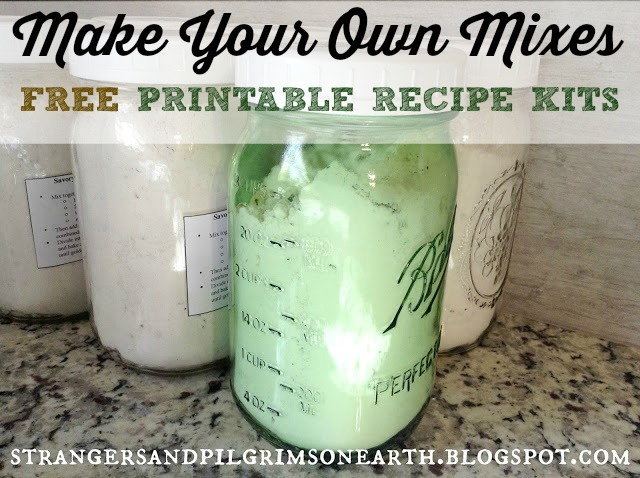 We will use ours in our morning smoothies and blended with kombucha (my sister in law taught this to me, so tasty!). The best way to freeze your fruit is on trays or cookie sheets without them touching (after they are hulled). 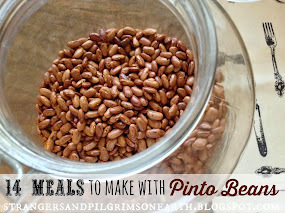 Once frozen, remove them from the tray and place them in a freezer bag or plastic container. Flash freezing (as this method is called) the strawberries first helps to keep them from sticking to each other so that you can grab a small amount of berries at a time when you need them. We also tried something new this year and it is one of the healthiest ways you can preserve your berries (because everything is raw). 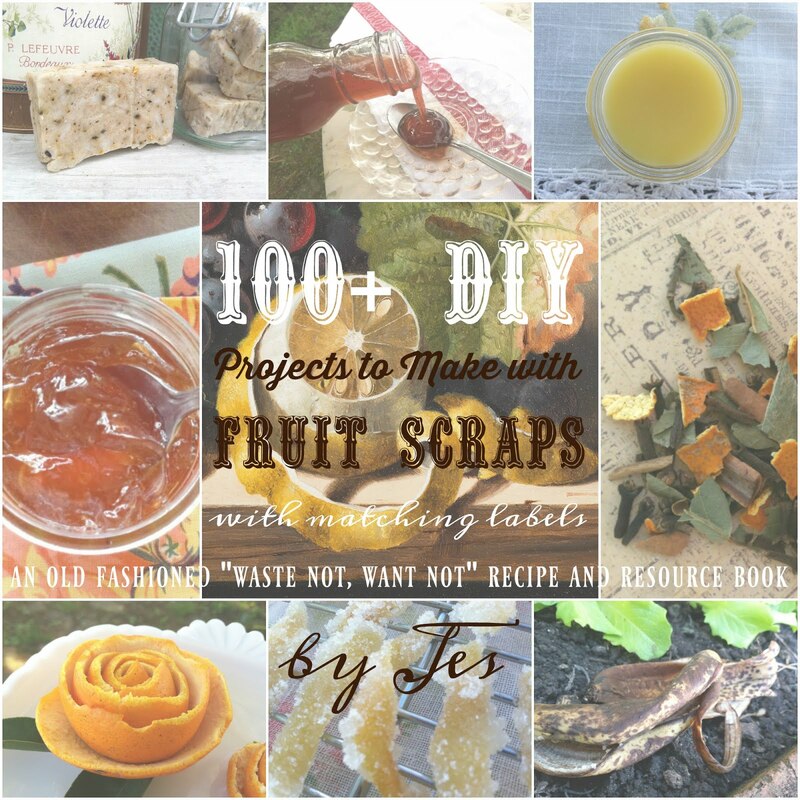 The author calls it refrigerator jam but it can also be frozen. 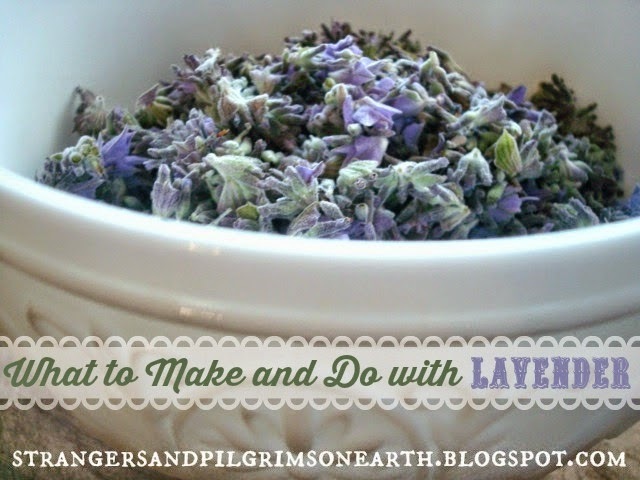 It is so simple to make! All you need are chia seeds, honey, strawberries and a blender. 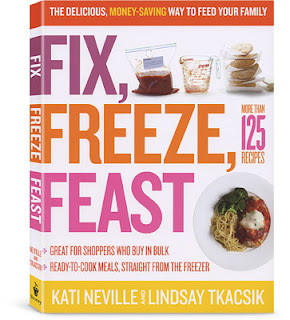 No cook, no hassle… just refrigerate and/or freeze your extras. I did about 4 quarts of this. Our freezer space is dwindling and so I decided to prepare the rest of the jam for our pantry. In order to maximize the canning mess, I wanted to make sure we had enough jars to fill up our canner for a complete batch of jam. 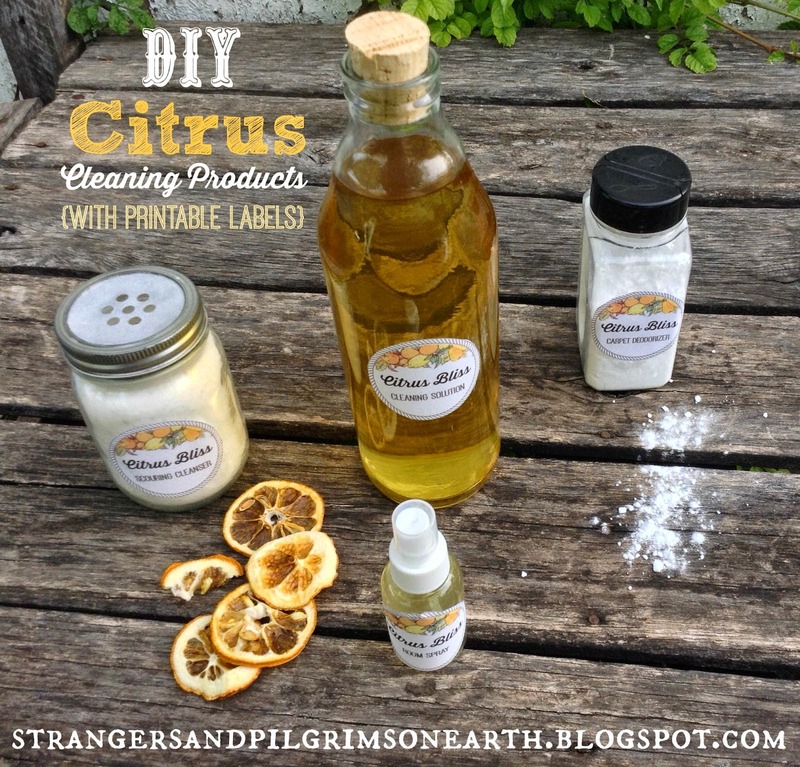 Using the low/no sugar pectin, here is the recipe I used which gave me approx. 7 pint jars of strawberry honey jam. This was a good jam but it doesn't taste exactly like the regular sugar laden jam recipe that many of us are accustomed to (honey has a distinctly different flavor). My husband really liked it but I am ashamed to say that I might opt for the low-sugar recipe next time using a reduced amount of sugar instead of honey. 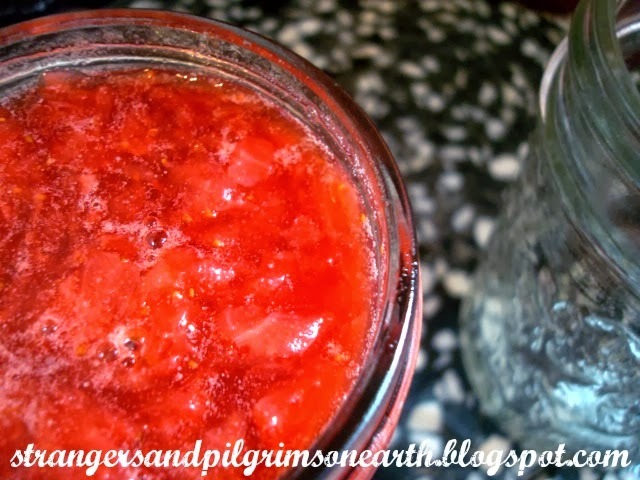 I also tried making another strawberry honey jam which doesn't require the purchased pectin. Shredded apples are added into the pot which is naturally high in pectin (the thickener for jams) because strawberries are low in pectin. This recipe came out very good, just keep an eye on it so that it doesn't burn because it does require more cooking time to get the desired consistency. 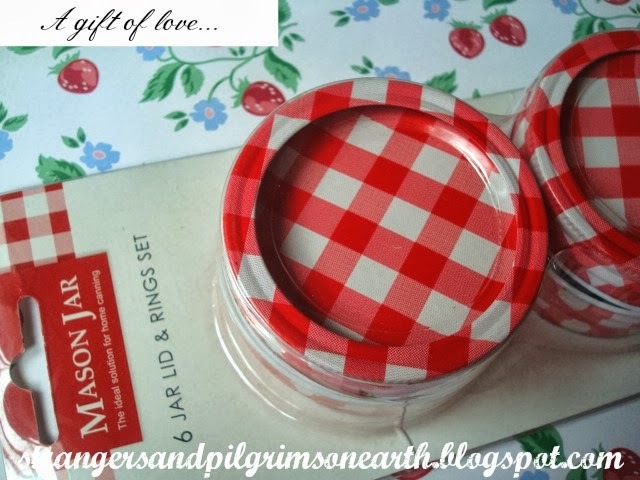 I also couldn't resist showing you my gingham canning lids. These were sent to me in the mail as a surprise gift! It was during the time of our move across the country (and leaving family and friends). 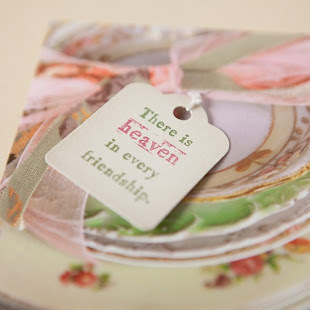 I hardly knew this woman but her package arrived in the mail and I loved her instantly for her sisterly love. I haven't found these anywhere in the United States (this and this are the closest I came to them). I think she may have purchased them in Australia! What a special gift this was! We also prepared some fruit leather with our left over strawberries. Dipping them in chocolate makes them into a delightful dessert. 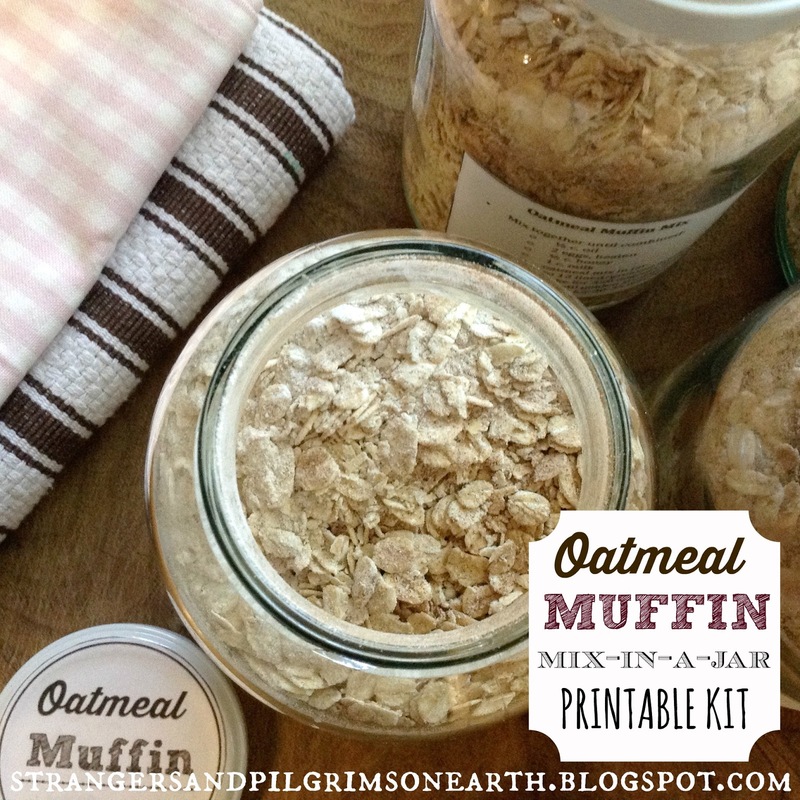 Might I also mention that the jam would be delicious in our fruit and cereal grain bar recipe? However, when all is said and done, our favorite way to utilize the strawberry is to eat them while they are still nice and fresh (and as much as we can)! 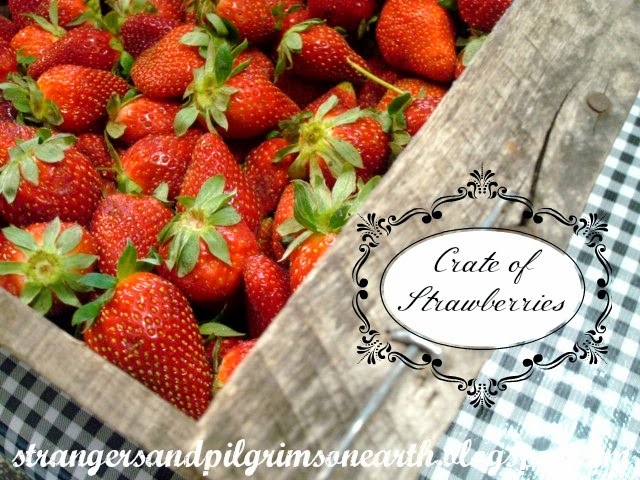 They are "jam" packed with vitamin c so I find them to be the tastiest supplement in God's pharmacy! 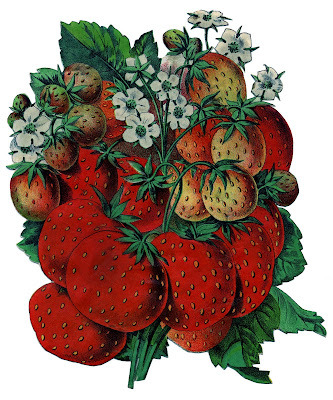 "The Strawberry.—The flavor of antiquity rests upon the wild strawberry. 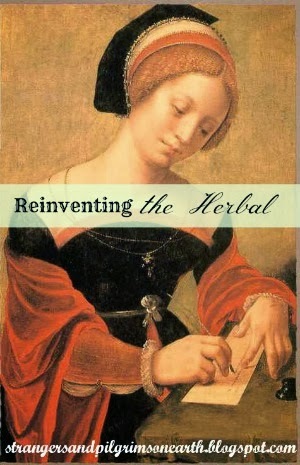 Its fruit was peddled by itinerant dealers about the streets of ancient Grecian and Roman cities. 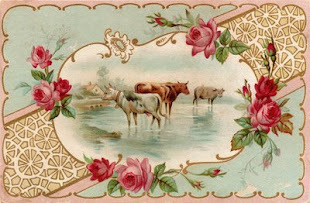 Virgil sings of it in pastoral poems, and Ovid mentions it in words of praise. The name by which the fruit was known to the Greeks indicates its size; with the Latins its name was symbolic of its perfume. The name strawberry probably came from the old Saxon streawberige, either from some resemblance of the stems to straw, of from the fact that the berries have the appearance when growing of being strewn upon the ground. In olden times, children strung the berries upon straws, and sold so many "straws of berries" for a penny, from which fact it is possible the name may have been derived. 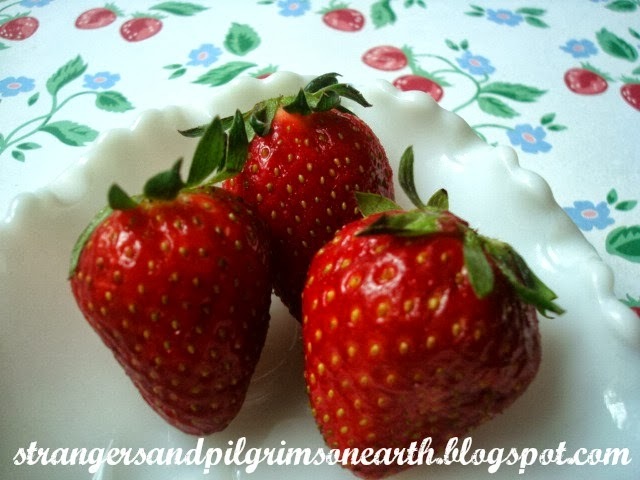 The strawberry is indigenous to the temperate regions of both the Eastern and Western Hemispheres, but it seems to have been matured in gardens, only within the last two centuries." 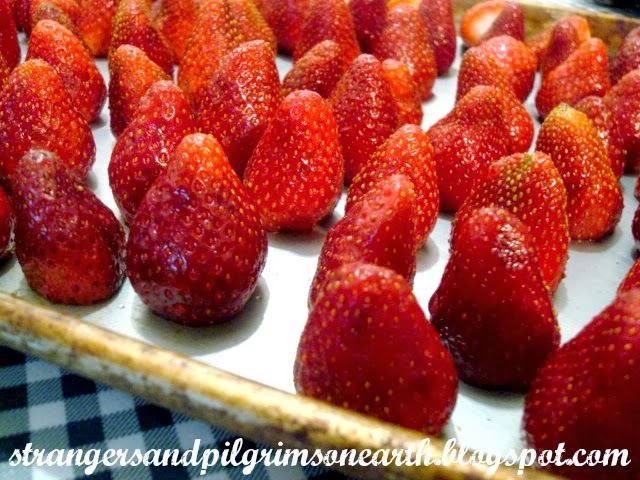 What do you do with your sweet strawberries? All the fine print. 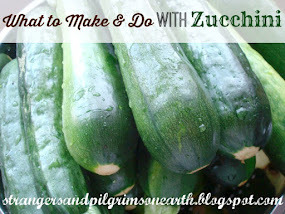 This post may be shared with some or all of the following link-ups: The Art of Home-Making Mondays, Modest Mom Monday's, Monday's Musings, Make Your Home Sing Monday, Good Morning Mondays, The Scoop, Titus 2 Tuesdays, Tuesdays with a Twist, Raising Homemakers, Wise Woman Link Up, Homestead Blog Hop, Wow Us Wednesdays, Coffee and Conversation, Homemaking Thursdays, Home Sweet Home, Our Simple Homestead, From the Farm Blog Hop, Awesome Life Friday Link Up, Five Star Frou Frou Friday, Shabbilicious Friday, Simply Natural Saturdays and Clever Chicks Blog Hop. Thank you lovely ladies for hosting these. This post may contain affiliate links (which are merchant links that help to support this site at no additional cost to you if you purchase an item through them). Strawberry graphic was found here. 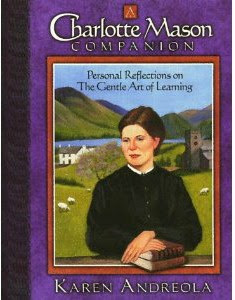 "The ordinary arts we practice every day at home are of more importance to the soul than their simplicity might suggest." 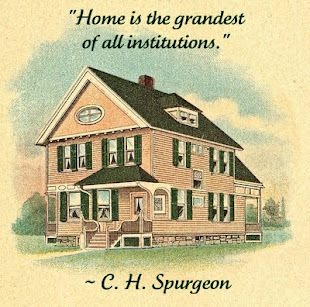 There are so many wonderful features in the making of a home. 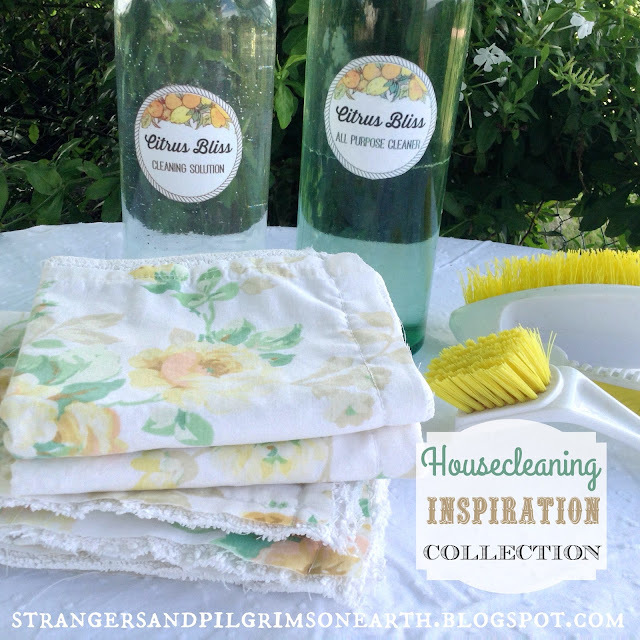 This is a place where I would love for you to share your love for anything home-related. 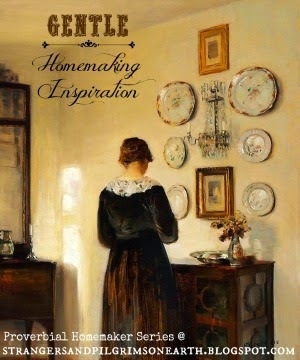 Homemaking, homeschooling and homesteading are all a part of the lovely art of home-making! 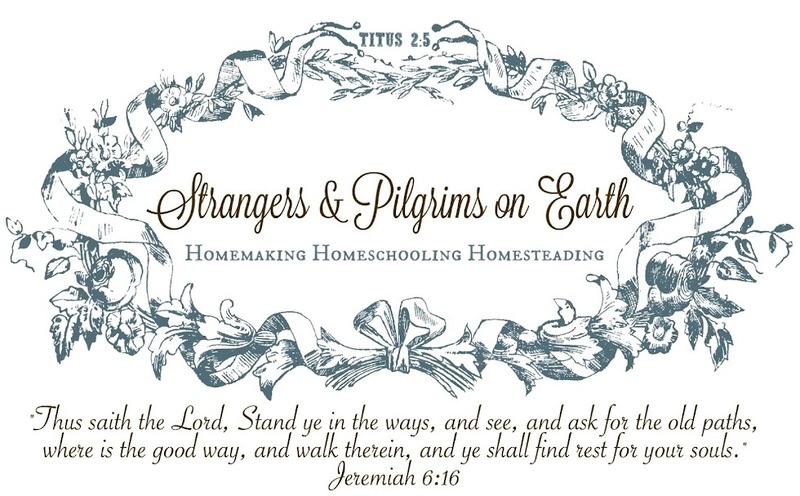 Please link up what is in your heart and home this week in the spirit of Titus 2 and Proverbs 31 (such as recipes, godly encouragement, DIY's, frugal living, child-raising, medicine making, preparedness, home decoration, school lessons, etc). You are welcome to share as many posts as you like! 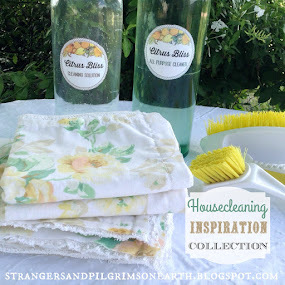 If you don't have a blog, please leave a comment of what has been going on in your home this week. I would love to hear from you! 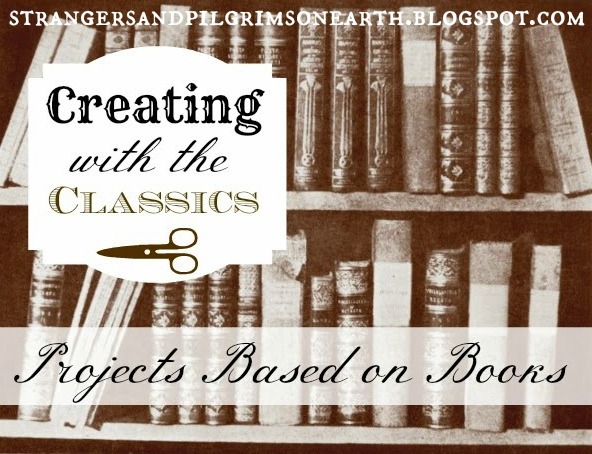 Please copy the button below (html code is in box below it) and share on your blog post or side-bar so others can come and join in the link up as well! 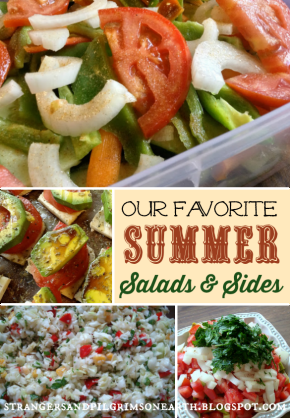 Or, simply link back to this post when you are sharing. Thank you for joining us! 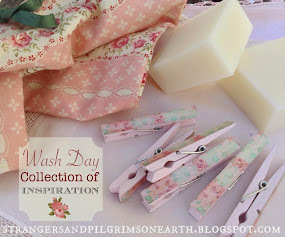 This post may be shared with some or all of the following link-ups: Modest Mom Monday's, Homestead Barn Hop, Teach Me Tuesday, Raising Homemakers, Make Bake Create, Wise Woman Link Up, Christian Homemaking, Wow Us Wednesdays, Wildcrafting Wednesday, The Scoop, Homemaking Thursdays, From the Farm Blog Hop, Encouraging Homemakers, Farmgirl Friday, and Clever Chicks Blog Hop. Thank you lovely ladies for hosting these.